Let me be perfectly clear and openly state: I am a life-long user of libraries and I have no intention of stopping. As a Lambeth resident I use both Brixton and Minet Libraries, one because it’s central and has a bigger selection, the other because it’s closer to home and has a good selection of books, DVDs and comics. The staff members are really approachable and helpful in both libraries too. I find it odd and worrying that so many people seem to have forgotten about libraries – never popping in on the off-chance of getting out something new or an old classic, or just browsing and coming across some obscure treasure. Even many friends – up to date in the fights against cuts in public services – seem not to remember that libraries offer books, computer usage, DVDs and CDs for very little and a whole wealth of knowledge. You can get Series 1 and 2 of Borgen and all three series of The Killing for a tiny pittance for goodness sake! And every Lambeth library except West Norwood offers free, unlimited Wi-Fi access. So Lambeth’s libraries are in Brixton, Herne Hill (Carnegie Library), Clapham, Kennington (Durning Library), Streatham, Tate South Lambeth, Upper Norwood, Waterloo and West Norwood. 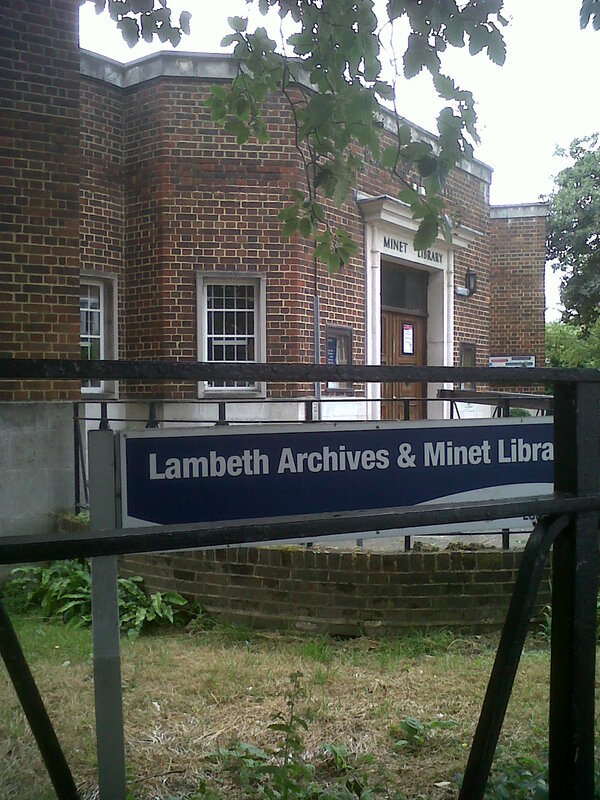 And don’t forget the irreplaceable Lambeth Archives and Minet Library. It’s not just the service for old fogeys, youngsters flock into Lambeth’s libraries to catch up with friends on the computers, do homework and even get books out. The staff are going all out to entice people back to the libraries – under threat from council cuts – with anything from reading competitions to film evenings – at Minet library on the first Tuesday of every month (or the last Wednesday at 2pm) you can sip a glass of wine and watch some fascinating old classics like Ida Lupino’s 1953 The Hitch-Hiker and Orson Welles’ 1958 Touch Of Evil. PS did you know that Ida Lupino was born and raised in Herne Hill? No, neither did I, but the library staff did. Yeah, yeah – you can get Netflix and LoveFilm etc etc but this is about more than ease of hire, it’s about bringing a disparate community together for an evening watching a film and then discussing it. People from all walks of life and ages come along to the library and you see dads and mums reading to their kids, old people catching up with the news and youngsters doing their homework at the tables. They are not as S-I-L-E-N-T as they used to be ‘back in the day’ of far off times but who cares. There’s a buzz and a joy of people all doing something they enjoy – together. Brixton offers a great reference and information service and a good, quiet place to study or work and you can find out all about Lambeth and its history at the Lambeth Archives at Minet Library. Or head to www.lambethlandmark.com for a history of the borough in pictures. The borough’s diverse and the libraries stock books in 19 languages and offer all kinds of activities including literacy classes and silver surfers and computer workshops. Hire a few DVDs, read some library books, go along to a classic film evening – it’s not much of an effort but it might be the difference the libraries need for when the debate about closing them comes around again. And I gather that the debate has only been postponed. So go to www.lambeth.gov.uk/libraries and visit its online catalogue and pop into your local and join now. I am NOT a librarian secretly trying to muster up support, I AM a library lover and do not want to see our local libraries replaced by yet another chain or another **^%&^&^^*&* estate agent. Let’s keep it real local! And if you are concerned about losing our libraries and services why not visit www.lambethsaveourservices.org and see what others are doing. Categories: Action, Community, computer training, Development, Events, History, Libraries, Poetry & Literature, Young people | Tags: Brixton Library, Community, Cuts to services, herne hill, lambeth, Lambeth Archives and Minet Library, Lambeth Council, Lambeth history, Lambeth Save Our Services, The Killing | Permalink.